Spirit Lake, Iowa is one of the most beautiful and dynamic cities in the Midwest. With a four-seasons lifestyle, thriving business climate and a warm, friendly quality of life, you’ll find it all here in Spirit Lake. In 2015, Spirit Lake, Iowa was recognized by Governor Terry Branstad as one of the healthiest cities in Iowa, winning the 2015 Healthy Iowa Award in the small city category. The Healthy Iowa awards is a joint program of the Iowa Department of Public Health and the Healthiest State Initiative, which recognizes individuals and organizations that have developed and implemented policies and practices resulting in sustainable environmental change and healthier living for Iowans. 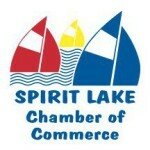 Spirit Lake has a vibrant downtown with an appealing mix of retail and service oriented businesses. The City has an industrial park that provides the space, accessibility and amenities to meet the needs of current and prospective employers. Our neighborhoods are safe and our abundant system of public parks provide opportunities for recreation. Spirit Lake is a rapidly developing city, boasting one of the fastest growing economies in Northwest Iowa. New residential areas are developing in the southern part of the city, retail and commercial businesses are locating along the Highway 71 corridor and downtown. Spirit Lake is a great place to raise a family. We have excellent schools and many opportunities for involvement in religious activities, scouting, dance, and art. Children are safe here and can enjoy the quality of life that we all want them to have. Spirit Lake is a major employment center for Dickinson County and surrounding areas. From industrial production jobs to professional and retail positions, the opportunities for employment are varied and continuing to grow. The City has the widest variety of housing options in the Iowa Great Lakes area. Whether lake front living, single family homes, condominium, town home, or apartment living, opportunities for housing are great and expanding rapidly. Lakes Area residents are increasingly promoting sustainable living activities. Our community has an active farmers market. A grower’s cooperative promotes the sale of locally-grown produce and there is an active community garden. The City has enacted low-impact development regulations and has been implementing innovative storm water management measures.